Feel the warmth of Tropical North Queensland, as you arrive smell the sweet scent of the wet tropics and see expansive mangroves on your way into Cairns. You will be personally met at the airport by a DISCOVER AUSTRALIA representative and transferred from the airport to your hotel. You can relax and use the rest of the day to explore your hotel and its facilities, perhaps take a stroll around the neighbourhood and central Cairns. Meet and Greet Personalised Arrival Transfer, Overnight Cairns Accommodation. Discover tropical Cairns after being picked up by your friendly driver for your half day tour of Cairns. Visit St. Monica's Cathedral, which features the world’s largest, themed stained glass windows. Enjoy afternoon tea of scones and jam at the Flecker Botanical Gardens, renowned for having one of the best exhibitions in Australia of tropical plants. Take in spectacular views of Cairns from various vantage points and lookouts before touring to Barron Falls in the Barron Gorge National Park for a walk to the stunning Surprise Creek Falls in the UNESCO World Heritage listed Wet Tropics. Later, visit idyllic Palm Cove in Cairns’ Northern Beaches and enjoy a stroll along the beach or a walk to the end of the jetty to watch the sun set behind the mountains before being returned to your Cairns hotel. Breakfast, Half Day Cairns Town Tour with Hotel Pick Up, Afternoon Tea, Overnight Cairns Accommodation. The charming tropical village of Kuranda is set in the World Heritage Listed lush emerald Wet Tropics Rainforest. It is famous for its bohemian atmosphere, vibrant markets, cafes, galleries, shops and butterfly sanctuary. The surrounding Barron Gorge National Park features a thriving and ancient rainforest jungle, Barron River and breathtaking Barron Gorge with its cascading, thundering waterfall. Your friendly driver will pick you up in the comfortable air-conditioned luxury coach before sharing experiences, fascinating facts and enchanting stories in the onboard full commentary throughout the day. Journey up on to Kuranda on the historic Scenic Railway through the tropical rainforest jungle, over steep ravines and gorges and directly past picturesque waterfalls. Experience an up-close tour of the ancient rainforest and river system on-board an amphibious duck. Explore Kuranda the village in the rainforest. Travel back down, gliding just above the rainforest canopy and gorges in a Skyrail Rainforest Cableway gondola. This famous Kuranda Scenic Railway is a remarkable journey providing unsurpassed views of thick rainforest, steep ravines, picturesque waterfalls and gorges en route to Kuranda in the Atherton Tablelands. Construction started in 1882 and it is considered an engineering feat of tremendous magnitude. Hundreds of men built the 15 handmade tunnels and 37 bridges that stand as a monument to the pioneers of tropical North Queensland. Rising from sea level to 328m, the nearly 2 hour journey from Cairns to Kuranda passes through World Heritage protected tropical rainforest, awesome Barron Gorge National Park, Barron River and Stoney Creek. Upon reaching the village of Kuranda a rich assortment of fascinating touring and unique shopping experiences awaits you. Explore the depths of the rainforest using the most appropriate transport - an amphibious World War II Army Duck with 6 wheel drive for the forest floor and a propeller and rudder for cruising the waterways. The rainforest is very ancient and complex, with some primitive plants like tree ferns dating back over 150 million years. On our unforgettable 45 minute rainforest tour, you will see and learn about massive butterflies, ferns, orchids, strangler figs, stinging trees, azure coloured kingfisher and a host of other plants, animals and reptiles. After splashing into the waterway with propeller engaged, your Army Duck cruises up to the water's edge whilst turtles, fish and eels swim up close (look out for water dragons and pythons). Today we also visit a tropical fruit orchard growing more than 60 different types of delicious tropical fruits. Spend time at your leisure wandering through the picturesque forest village with its bohemian atmosphere, cafes and famous markets featuring impressive local arts and crafts. Board your Skyrail Rainforest Cableway gondola with remarkable views of Cairns, the lush tableland region, distant mountain ranges and right out to the turquoise Coral Sea and the Great Barrier Reef. Start your journey back down gliding metres above the rainforest canopy before descending through the canopy layers and deep into the heart of the forest at Skyrail's two rainforest mid-stations at Barron Falls and Red Peak (alight here onto rainforest boardwalks, interpretive information available through short guided boardwalk tours and an interpretive centre). Travel above Barron Gorge National Park and dense World Heritage listed rainforest. As your coach finally takes you back to your hotel, you will have experienced a day filled with new memories to treasure forever. Breakfast, Luxury Day Tour with Return Transfer, Kuranda Scenic Railway, Army Duck Rainforest Tour, Skyrail Rainforest Cableway, Overnight Accommodation. Cairns is set on the azure waters of the Coral Sea and Trinity Inlet, a magnificent tidal estuary with waterways winding through a 300 square kilometre maze of mangroves with a rich diverse wildlife and stunning scenery. You will be picked-up from your hotel, travel through Cairns and be transferred to the boat harbour to join this amazing 2 hour cruise of Trinity Inlet, the picturesque wilderness right on Cairns doorstep. Relax on this scenic calm water cruise whilst crocodile and bird spotting, learn about the life of a crocodile (including their breeding habits with the chance of seeing crocodiles basking on the muddy banks in their natural habitat). Cruise along the Cairns harbour waterfront learning about the points of interest and the history of the harbour, enjoy the incredible scenery of the estuary, mangroves, rainforest and mountains. Morning tea is included. Your comfortable, air-conditioned vessel has a fully licensed bar with snacks available. Your appetite is sure to be strong following your relaxing cruise and the fresh sea air. Enjoy your Special Waterfront Lunch at one of Cairns’ best restaurants - serving the finest steaks from the grill, fresh local seafood, delicious pastas and tasty specialist foods. This absolute waterfront venue has some of the best food in Cairns and an informal cool tropical atmosphere making your Cairns Special Lunch truly memorable. 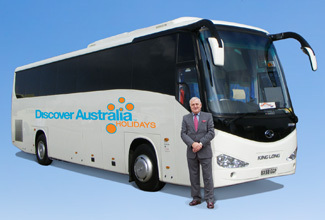 Breakfast, Luxury Day Tour with Hotel Pick-Up, Harbour Cruise, Morning Tea, Special Cruise Lunch, Overnight Accommodation. The World Heritage Daintree region is a tropical paradise of pristine rainforest and unbelievable white-sand beaches. The area boasts magnificent mountains draped in lush-green jungle and mighty gushing rivers. It includes spectacular destinations such as Daintree Village, the Daintree River, Snapper Island and stupendous Cape Tribulation. Highlights are the breathtaking views from Alexandra Lookout, cruising on the wildlife laden Daintree River, learning about unique Daintree wildlife like the cassowary, tree kangaroo and rat kangaroo and seeing fan palms, flying paradise kingfishers, tree frogs and butterflies of every colour. The famous Daintree Wet Tropics is far from the buzz of civilisation, combining both awe and tranquility - a true solace to the soul. It doesn't get much better than this. Today we explore the region where the tropical rainforest literally meets the azure sea. Highlights include Port Douglas, Scenic Coastal Drive, Wildlife Habitat, Vehicular Cable Ferry, Guided Rainforest Walk, Cape Tribulation Beach, Alexandra Lookout, Daintree River Cruise, a splendid tropical lunch and the dense impenetrable jungle rainforest. Journey north along the Cairns' Northern Beaches to Port Douglas via the Captain Cook Highway (truly one of Australia's most scenic coastal drives), head inland passing sugar cane fields towards Daintree National Park, cross the Daintree River on a cable driven ferry, stop at Alexandra Lookout to witness magnificent views of the Daintree River and azure Coral Sea, cruise the Daintree River (spotting for crocodiles, tree snakes, water birds and other wildlife as your guide takes you through the mangroves along this crocodile infested river), visit Wildlife Habitat (guided tour of the three wildlife environments - rainforest, wetlands and grasslands, including morning tea, wander along elevated boardwalks and observe up close a huge range of wildlife as birds and animals fly and roam freely, plus feed kangaroos, see crocodiles and the endangered cassowary and Lumholtz's tree kangaroo), travel deep into Daintree rainforest to enjoy a generous tropical lunch, enjoy free time to explore Cape Tribulation Beach (dazzling untrodden white sand beaches capped by an azure tropical sea, meet the dense green of the rainforest jungle, where the native palm trees grow right onto the beach sand), discover more remarkable Daintree wildlife on a guided rainforest walk (great photo opportunities). Enjoy complimentary afternoon tea before returning to Cairns. Breakfast, Luxury Coach Tour with Hotel Pick Up, Morning Tea, Tropical Lunch, Daintree River Cruise, Guided Rainforest Walk, Vehicular Cable Ferry, Afternoon Tea, National Park Fees, Overnight Accommodation. This morning board the Coral Expeditions II at Cairns Cruise Liner Terminal and begin your 4 day adventure in the Southern Great Barrier Reef. You will be personally met at your Cairns hotel by a DISCOVER AUSTRALIA representative and transferred from your hotel to the Cairn’s Cruise Liner Terminal to board the Coral Expeditions II . Cruise through Trinity Bay as you enjoy views of scenic Port Douglas. Soon you arrive at your first exclusive mooring site. Cruises alternate between Thetford Reef, Coates Reef and Nathan Reef. You may get off the vessel to snorkel or SCUBA Dive or alternatively if you don’t want to get your feet wet you may enjoy a glass bottom boat tour, view a fish feeding display or an onboard presentation by a Marine Biologist. This evening, enjoy welcome sunset drinks on the desert Sudbury Sand Cay before enjoying a special seafood buffet dinner back on board the Coral Expeditions II. Breakfast, Meet and Greet Personalised Port Transfer, Lunch, Snorkelling, Diving, Glass Bottom Boat Tour, Sunset Drinks, Special Seafood Buffet Dinner, Overnight Accommodation onboard the Coral Expeditions II. This morning, cruise the spectacular Hinchinbrook Channel that separates Hinchinbrook Island from the mainland. Look out for crocodiles, dolphins, whales, turtles and dugongs as you cruise through the Channel. Enjoy a tour of the surrounding mangroves as you take in the interpretive commentary and breathtaking views. Enjoy some time on a tropical island where you will enjoy a guided bushwalk, a gourmet Aussie beach BBQ and the chance to snorkel or dive over the island’s fringing reef which showcases a magnificent garden of giant clams. You also have the chance to kayak, take a glass bottom boat tour or relax on the beach before returning to the Coral Expeditions II for the night. Breakfast, Mangrove Tour, Guided Bushwalk, Aussie BBQ Lunch, Snorkelling, Diving, Glass Bottom Boat Tour, Dinner, Overnight Accommodation onboard the Coral Expeditions II. Today, after breakfast, enjoy a rainforest walk on Dunk Island with your naturalist guide. Look for the electric blue Ulysses butterfly before spending the afternoon exploring the colourful Nathan Reef. You have the opportunity once again to snorkel, SCUBA dive or enjoy a glass bottom boat tour. You can also experience an interactive marine biology presentation at the onboard display tank. Breakfast, Lunch, Snorkelling, Diving, Glass Bottom Boat Tour, Marine Biology Presentation, Dinner, Overnight Accommodation onboard Coral Expeditions II. Take the opportunity to explore Fitzroy Island this morning. Take beautiful bushwalks and hikes, snorkel over the fringing reef and enjoy beachcombing on the white sand of Nudey Beach as well as the chance to enjoy the resorts facilities. You will return to Cairns this afternoon and you will be personally met at the cruise terminal by a DISCOVER AUSTRALIA representative and transferred to Cairns Airport for your flight home. 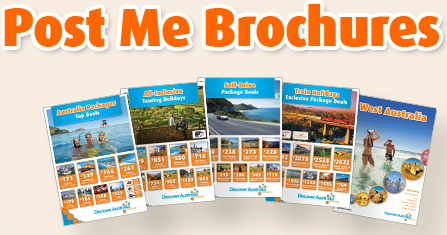 Breakfast, Bushwalks, Hikes, Snorkelling, Meet and Greet Personalised Departure Transfer. You have 3 choices of accommodation in Cairns. Our "Good Standard" central Cairns hotel has great facilities, a comfortable room and friendly service (typically 3.5 stars). Alternatively, why not treat yourself? The "Deluxe" hotel has superior facilities, stylish room and first class service (typically 4 stars). The “Luxury” hotel is upscale with a more luxurious feel for the discerning traveller and great for celebrating an anniversary (typically 5 stars). You will be personally met by a DISCOVER AUSTRALIA representative and transferred from the airport to your hotel, from your hotel to the cruise liner terminal and from the cruise liner terminal to the airport for your flight home. You’ll receive the FREE DISCOVER AUSTRALIA Bonus Voucher Book that includes $500 value of discounts and bonuses throughout Cairns and Queensland at shops, restaurants attractions etc. It’s a great way to save even more on your Queensland holiday. 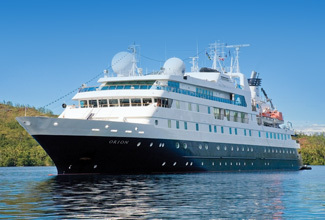 For 33 years, Coral Expeditions has focused on small ship expedition cruises to faraway lands. The fleet of three (soon to be four) Australian-flagged and crewed ships were purpose-built for exploring. The fleet of three expedition style cruise ships has been specially designed and purpose-built to our exacting standards. With no more than 120 guests, there are no queues. The cuisine is small-batch, our wines are Australian artisanal, and the service is personalised. Come explore your world with Australia’s pioneering cruise line. Large enough to provide all the modern amenities and comforts of larger cruise ships, yet small enough to enable us to access reef and island sites inaccessible to other vessels. Australian registered and staffed, whichever Coral Expeditions small ship you choose to cruise aboard, you are assured of a personalised and unique adventure. The Cairns All-Inclusive with 4 Day Great Barrier Reef Cruise is very popular. Many dates book out well in advance, please book soon.